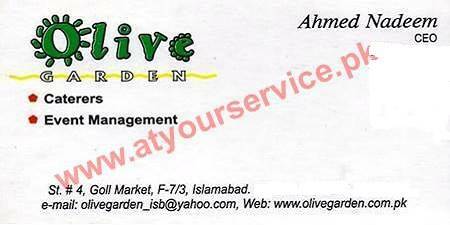 Olive Garden is located in F-7/3, Islamabad. It is a multi cuisine restaurant where you can visit with your family and friends. We also provide catering service for your special occasions. Our event planner are the best. Give then the task to plan and manage your special event and then sit back and we will make you feel like guest instead of the host.